New Multi-Layer Structure and Exact Fit to Cavity Combine to Prevent Screen Failures and Product Contamination, Reducing Downtime and Yielding More Saleable Product, Nordson says. September 24, 2018: New screen packs for BKG® screen changers from Nordson Corporation effectively withstand the pressures of extrusion, providing maximum filtration and optimum melt flow while ensuring a longer working life and greater reliability than low-end screen packs on the market, the company claims. Nordson will introduce the screen packs at Fakuma 2018 (Booth A6-6109). According to the company, one key to the enhanced performance of the new screen packs is a robust multi-layer structure that prevents failures caused by the pressure differential—up to 200 bar—encountered during filtration. One such failure is “screen dimpling,” in which the mechanical stress forces screen layers into the holes of the breaker plate that supports the screen in the cavity. This distorts the screen, breaking the peripheral seal and causing contaminants to bypass the screen and become part of the end product. Nordson says that it precisely tailors the size of the screen pack to the dimensions of the cavity, eliminating the common problem of contaminant passing the screen pack at the edges. In addition, all screen pack components are ultrasonically pre-cleaned during manufacture to eliminate contamination from the oil and grease used in the weaving process. Depending on customer requirements, Nordson supplies the screen packs with different layer combinations. One common structure, for example, has four layers, including two coarse square-weave layers that serve as the outer components and a finer internal square-weave layer. These provide support and drainage functions and withstand high tensile forces, says Nordson. 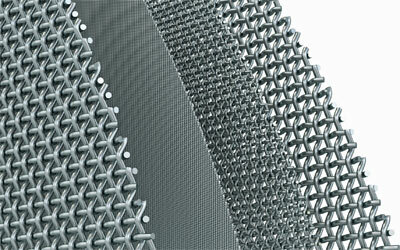 The fourth layer is an optimized Dutch weave wire mesh that serves as the fine filtration component. The small geometric pore size of the Dutch weave layer ensures high permeability. Filtration takes place crosswise with respect to the direction of melt flow, enabling dirt particles to be separated from the melt. Founded in 1954 and headquartered in Westlake, Ohio, Nordson Corporation has operations and support offices in more than 30 countries. Nordson Polymer Processing Systems provides customers with engineered components to melt, homogenize, filter, meter, and give shape to plastic and fluid coating materials. Nordson delivers a full range of precision melt stream products — from screws and barrels for extrusion and injection molding — to filtration systems, pumps, and valves — to the extrusion dies and pelletizing systems to meet the constantly evolving needs of the polymer industry.